Shadwen, the stealth game by Frozenbyte announced two months ago, now has a demo on Steam tied to a peculiar initiative: the more people play through the demo, the lower the price of the final game will be. Clearly this is an attempt to drive interest around Shadwen, and yesterday some key developers of Frozenbyte also participated in a Reddit AMA to further boost visibility around the project. It was also an opportunity to talk about what went wrong with Trine 3, the latest and most controversial entry in what had previously been a beloved franchise. There seems to be a consensus within the team that miscommunication about the scope and length of Trine 3 was chief among the issues of the game. We failed miserably with the communication, delivery and everything else regarding Trine 3. We intended to tell everyone that our launch price, $21.99, was supposed to reflect that the game was first part of a $60 Trilogy. But as said, there’s no excuses from our side and we are deeply sorry for failing. As for now, we must try to make a comeback. Giving up since so many people hates us seems just wrong. We thought we had done a masterpiece. Unfortunately we failed with communication and everything else, giving our fans completely wrong idea about our intentions and about the game. Now we understand our failures, but it’s of course too late for Trine 3. Personally, it’s mostly marketing related, as we were kind of tiptoeing around the subject (length/story) and it failed massively. We should’ve been more upfront about it. If I had a time machine I’d go back in time 2-3 years (and assuming I wouldn’t prevent us from starting work on Trine 3 altogether), and make sure we get our production pipeline working way better way early. That way we could’ve added more length to the game and we probably could’ve handled the extra production cost at that time too. Trine is, and always will be our sweetheart. So we definitely will return to Trine universe at some point. At some point we would love to return to Trine universe, but at this moment we have to focus on finishing what we are working on and trying to make the comeback with those. Trine 3 includes level editor and there has been some really good user submissions lately. We will support Trine 3 as much as it’s possible for us with updates and possible new content. Back to the roots is a very possible choice at some point. For another 3D installment it’d take a lot of money, and it’s hard to say if we’ll ever have that kind of money again, but the older style is a bit less cost intensive… But again, can’t make any promises, we’ll see how things go. Back on Shadwen, though, the CEO dropped a hint about a possible PlayStation 4 version. 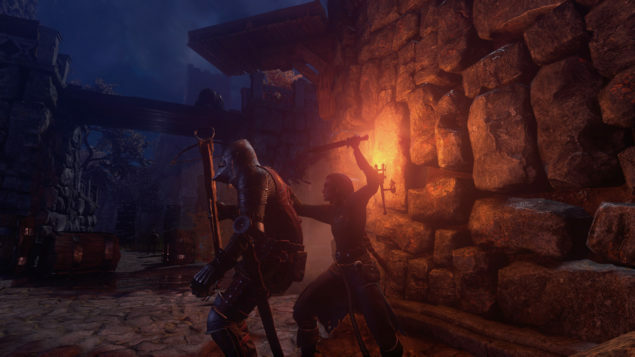 Indeed, the entire Trine trilogy is available on Sony’s PlayStation 4 and it seems fair to assume that Shadwen will be released on the platform. Did you try the demo yet and if so, what do you think of it?